My husband and I recently inherited a family heirloom. My father-in-law, who passed away in September, had a favorite chair that had seen better days. This is the story of its loving rejuvenation. Like me, Warren was a gardener. Before he retired, he taught high school agriculture, horticulture and floriculture for many years. He was so proud of me when I obtained my certification as an MSU Extension Master Gardener five years ago. I wanted to honor this bond by reupholstering his chair with a gardening theme. Combined with my current fascination with text fabric, the idea for a gardening phrase upholstery fabric was born. I gathered 22 favorite quotes, downloaded some gorgeous script fonts, and set to work with Photoshop. 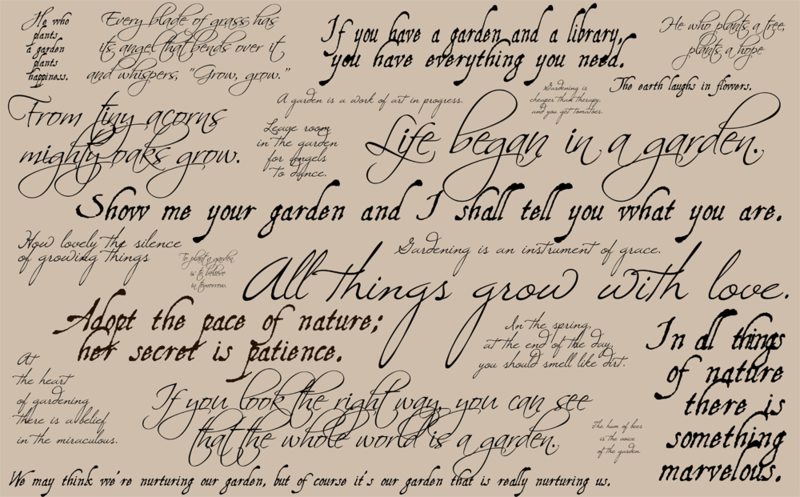 The fabric I designed with gardening phrases – click to enlarge. I saved the file as a high resolution jpeg and had the fine folks at Spoonflower print up eight yards on heavy cotton twill. I can’t say enough about the fast, friendly service at Spoonflower! I think they had skeptics like me in mind with their inexpensive swatch option and even a 171-color hex-coded chart to assure me that my beige background would indeed turn out beige. 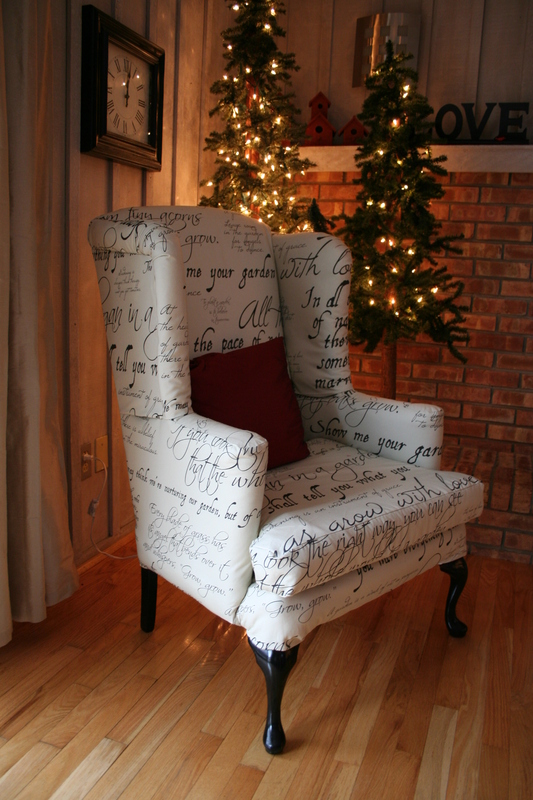 I’ve done re-upholstery before, so I had all the tools and, probably most importantly, the required audacity. But as I wasn’t sure there wasn’t some trick for wingbacks, I consulted the internet. Found this great series on YouTube by M J Amsden Furniture. keep notes about what came off when, and how it had been affixed. The removed pieces will serve as patterns for cutting your new fabric, and your careful notes can be used in reverse order when you are ready to start building back up. I couldn’t be happier with the results. I like to think Warren’s angel settles there once in a while, to warm himself by the fire and look out upon my garden.